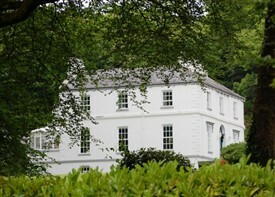 The Brownes lived at Ebor Hall, a stately house a few miles west of Clonbur on the road to Cornamona. William Browne de Montmorrency owned a tract of good land with about 15 tenants who paid him rent of £300 a year. Relative to the thousands of other landlords in Ireland, his acreage was small and he shunned the bright lights of London favoured by many of his colleagues, choosing to reside in Ireland where he enjoyed a comfortable lifestyle, hunting and fishing in the company of the landed gentry. However, the 1870's were troubled times, with impoverished tenant farmers and labourers beginning to rebel. 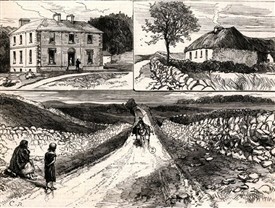 In 1879 the Land League was formed in Mayo, then extended to the whole of Ireland. 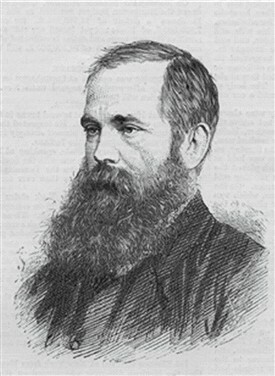 It aimed to abolish landlordism, and to return the land to its rightful owners. At mass meetings Michael Davitt and Parnell addressed the crowds, urged the people to resist eviction, demand the three Fs, fixity of tenure, free sale and fair rent. Agents and bailiffs were being threatened and killed, livestock harmed, the powerful weapon of boycott used against merciless landlords who began to fear for their lives. William Browne had been given the protection of two bodyguards but he got tired of them shadowing his every move and dismissed them. 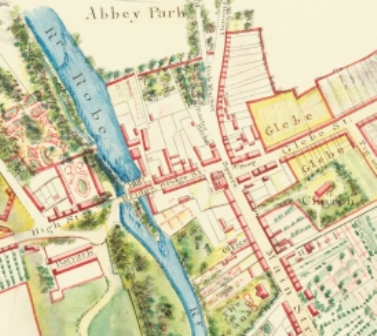 On one of his trips to Dublin Castle, he asked that the army be brought into the Clonbur area to suppress the activities of the Land League. This made him very unpopular with the locals. In early September, 1880, he served one of his herdsmen, Patrick Sweeney, with an eviction notice for non-payment of rent. Patrick was now being thrown out of the little cottage on the Browne estate in which he had lived for many years and to which he felt he was entitled for the good service he had given his master. He had nowhere to go and no money for the passage to America. On the 3rd of September, William summoned his wife Harriet to the drawing room. He checked the hallway for eavesdroppers, then closed the door. What is so important dear, I had planned on taking the steamer to Galway today, accompanied by Lady Ardilaun, and it leaves at 11 said Harriet. I forbid it, whispered her husband, in fact I have arranged for you and the children to spend some time at my cousin’s estate in Edinburgh. You will leave in a week’s time. It’s a lovely city, you will be safe there and you can shop at your leisure and attend the hunt balls with Isabel. Harriet was dumbfounded at this preposterous suggestion and at such short notice. The house will go to wrack and ruin, she said, the servants depend on me for day to day instructions, and what about my roses, with our head gardener gone, who is going to prune them, I was going to get Honora to do it under my supervision. I don’t know anybody in Scotland, all my friends are here, and the children, they will so miss their governess. Leave the management of affairs to me, William answered, write out a list for the servants, all will be fine, don’t worry. I will worry constantly she said. I noticed last Sunday as we rode home from services that the locals didn’t raise their hats to you as they used to, showed no respect at all, and I heard rumours about a young man, called David Feerick, an agent for the Brownestown estate, being shot and killed near Ballinrobe. What is to become of us if this violence continues? You must promise me two things before I agree to go away, one that you will drink less whiskey, it impairs your judgement, makes you less vigilant and two, that when you attend magistrates meetings in Clonbur, you will make sure to come home before dark. Sometimes the meetings go on late, dear, he said, but I have the utmost faith in Blackie to get me safely home, any hour of the day or night, and of course I will have my loaded revolver in my pocket. When this land league business blows over, we will all be together again. With sad hearts Harriet and children departed. On the 25th September, Lord Mountmorres sat into his carriage and drove to Clonbur for a magistrates’ meeting. There he and others decided the fates of poor farmers, sentenced them to imprisonment for petty crimes such as snaring rabbits, stealing chickens, a cow trespassing, driving a horse and cart in a reckless fashion through town while under the influence of alcohol. But on that fateful day, there were more pressing issues being discussed in Clonbur, namely, the activities of the Land League and how to counteract the violence against landlords and their agents. A resolution was passed calling on the government to adopt coercive measures, allowing for internment without trial of any persons suspected of involvement in the Land War. The first of many coercion acts was passed within a few months, and close to 1000 land league members detained and imprisoned. Viscount William Browne left the meeting around 8 p.m. Hadn’t he promised Harriett that he would be home before dark, it wasn’t yet dark, but the sun was sinking fast behind Mount Gable. Blackie was trotting at a steady pace, a tinker wandering the road had to run for cover into the ditch,William was in a good mood, looking forward to a few nightcaps, a woodcock shoot on the morrow with Lord Ardilaun, maybe a foxhunt the following Sunday. Six shots were fired, one to his forehead at close range, the other five also all hitting their target. He fell from the carriage, lay dying on the roadside. Flanagan’s was the nearest house; they wouldn’t allow his corpse to be brought into the house for fear of reprisal. Blackie trotted home with an empty carriage. Servants ran out to search for him, found his mangled body. His revolver was in his pocket and a bottle of whiskey was found in the well of the carriage. The killer or killers escaped over the hills and across Lough Corrib. Many were arrested on suspicion of the murder, including Sweeney, the Flanagans, men from Ballinrobe and Clonbur, but no one was ever convicted. Harriett and children went to live in England. Ebor Hall survived the war of independence, has been extensively renovated and today is a well-maintained residence looking out on the peaceful waters of the lake. Seven landlords were murdered during the Land War, along with several agents and bailiffs. William Browne was descended from a captain in Cromwell’s army; he had served an eviction notice on a loyal and hard-working herdsman. Michael Davitt alleged that he was a spy for Dublin Castle, and he was a landlord at a time when the small tenant farmers of Ireland decided that enough was enough, that the time had come to repossess the land that was unlawfully taken from them hundreds of years before. The passing of the Wyndham Act in 1903, marked the beginning of the end of landlordism in Ireland and all the bitter memories of famine, poverty, evictions and tyranny associated with it. This page was added by Averil Staunton on 20/11/2017. An interesting story, thanks for sharing Averil.